Sepa have issued 19 flood warnings and three flood alerts for the east coast of Scotland. Nineteen flood warnings have been issued across Scotland as a storm surge is forecast for the east coast. The Scottish Environment Protection Agency (Sepa) have also issued three flood alerts. It comes as rivers burst their banks on Thursday as stormy weather hit the country with gusts of up to 142mph. Both the River Ness and Dee burst their banks during the day, with police closing roads in both Inverness and Aberdeen. Flood warnings have been issued for Strath Oykel in Sutherland, Grangemouth, Moy Bridge, Portobello esplanade, Musselburgh coast, Prestonpans, Cockenzie and Port Seton, Dunbar, Lower Largo, Kirkcaldy, Kinghorn, Rosyth, Limekilns, Charlestown, Torryburn, Newmills, Culross, Longannet, Kincardine, Spey Viaduct, Eyemouth, Ballinluig, Glen Lyon, Grandtully Bridge and Taymouth. A flood warning means flooding is expected and action is required by residents. The water is expected to worst around high tide at 4pm. Fife, Lothians & Borders - Tides peak around 4pm & with storm surge heading south there's risk of coastal flooding. Will keep you updated. 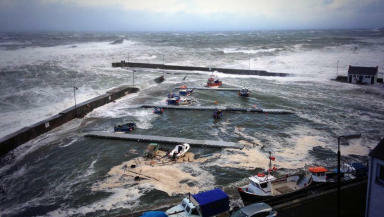 The surge has already seen water coming inland along the Aberdeenshire coast, with the harbour at Gardenstown swamped with high waves. Banff Community Centre was evacuated after flooding blocked access to the building on Thursday. All bookings and activities have been cancelled for the day and council staff are trying to relocate groups for the rest of the week. A council spokeswoman said: "We apologise to users of Banff Community Centre for the inconvenience and we are working with groups to try and minimise the disruption over the next few days until the facility can be reopened." Fife Council said they have staff out at high risk locations at high tide with sand bags and water pumps. Preparations are in place for rest centres in case residents need to be evacuated. In Edinburgh, roads leading to Portobello were closed including Bridge Street, Pipe Lane, Beach Lane and Joppa Plaza, with cyclists and pedestrians warned to stay away from the prom around high tide. Sand bags were also in place in Musselburgh.